The Bella Ride is available in 2 shades of Brown Microsuede or Black Microsuede in Medium Widths Only and has a suede sole. 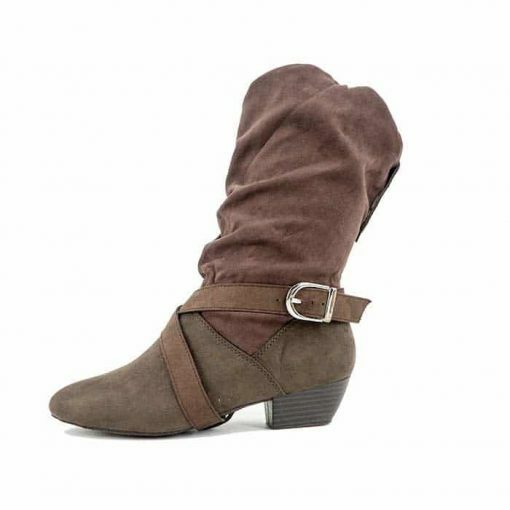 It has a 1-1/2″ Swing Heel and has a 1/2″ shank which allows for support and flexibility. NOTE: European to American Sizing is approximate. The information is shown as a guide only and not a guarantee. Actual fitting may vary. If upon receiving the boot it feels a bit snug, you may take out the top (2nd) innersole until such time as the boot stretches and then you can reinsert the innersole. If the boot is a bit wide, you may add additional innersoles. (See footwear accessories for purchasing additional innersoles). For inquiries about narrow or wide widths or colors other than the above, please contact the store at 1-810-238-7400 or email toetotoe1@comcast.net. Special order fees may apply.